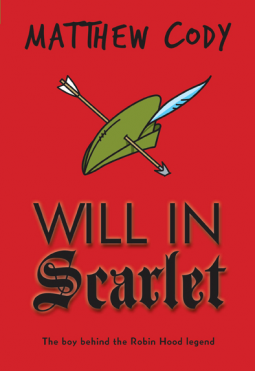 Will in Scarlet by Matthew Cody is a new look at the time of Robin Hood, from a completely new angle. Thirteen year old Will Shakley is the son of a lord, and has led a fairly charmed life. However, when his father is off at war fighting beside King Richard the winds change and treason is in the air. Will ends up in the forest struggling to survive. It is there that we all met up with a group of bandits. Through their trials and adventures young Will is a part of Robin Hood’s rise to power and fame. This is an exciting tale that will keep boys and girls from around 9 through high school interested. The story follows a thirteen year old struggling with his own identity and values. He faces challenges many of us cannot directly relate too, like fights with wolves, crazy chases through the woods, facing off with a bandit leader, and quite the fire. However the story also brings up things anyone today could face, such as dealing with an over protective mother, coping with an absentee father, and trying to live up with the exceptions others have for him. The adventures of Will and the unlikely crew of comrades he acquires has moments that made me want to hold my breath to see how things turned out, while others just had me reading faster so that I discover how everything would turn out in the end. Cody certainly offered a fan of the Robin Hood legends a fresh look at Rob, Little John, Sir Guy, the Sheriff, and the rest. I also appreciated the addition of Much, who really pulled through and saved the day on more than one occasion. I think readers new to the legend might find this a great motivator to take a look at other versions of the story.